[148 Pages Report] The voice recognition system market for automotive was valued at USD 876.1 Million in 2016 and is projected to reach USD 3,890.3 Million by 2025, at a CAGR of 19.41% during the forecast period. The base year for the study is 2016 and the forecast period is 2017–2025. 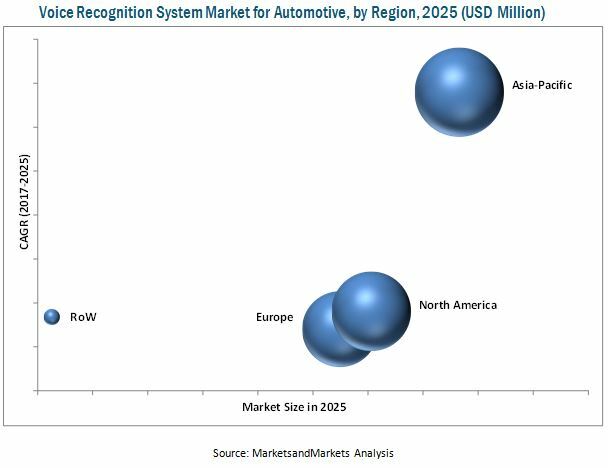 The voice recognition system market for automotive is primarily driven by the factors such as extended use of smartphones environment in cars, integration of technology to support centralized function, and rise in the level of autonomous driving and the trend of connected vehicles. The research methodology used in the report involves primary and secondary sources and follows bottom-up and top-down approaches for the purpose of data triangulation. The study involves country-level OEMs and model-wise analysis of automotive voice recognition system. This analysis involves historical trends as well as existing reach of the voice recognition systems for automotive by country as well as by level of autonomous driving. The analysis is based on various factors such as growth trends in vehicle production and regulations or mandates on the implementation of automotive electronics, which drive the voice recognition system market for automotive. 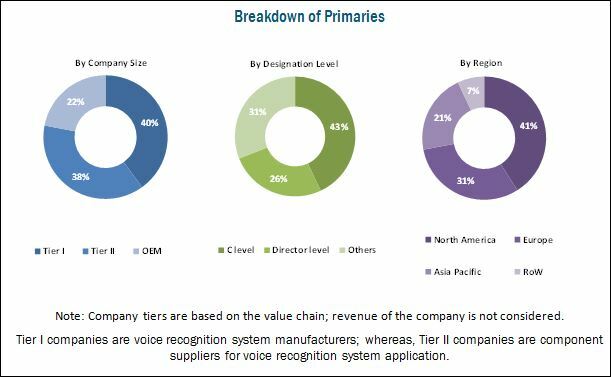 The analysis has been discussed with and validated by primary respondents, including experts from the voice recognition system market for automotive, automotive experts, manufacturers, and suppliers. Secondary sources include associations such as International Organization of Motor Vehicle Manufacturers (OICA), American Association of Motor Vehicle Administrators (AAMVA), Automotive Component Manufacturers Association of India (ACMA), and paid databases and directories such as Factiva and Bloomberg. The figure below illustrates the break-up of the profile of industry experts who participated in the primary discussions. The ecosystem of the automotive voice recognition system market consists of voice recognition system manufacturers such as Nuance (US), Microsoft (US), Alphabet (US), Harman (US), and Apple (US). The voice recognition systems are supplied to automotive OEMs such as BMW (Germany), Daimler (Germany), and Ford (US). The voice recognition system market for automotive is estimated to be USD 941.0 Million in 2017 and is projected to reach USD 3,890.3 Million by 2025, at a CAGR of 19.41% from 2017 to 2025. The key growth drivers for the market are the rising trend of autonomous vehicles, integration of several electronics functions in central console of the car by OEMs, and growing demand for connected vehicles. The non-AI-based segment is estimated to hold the largest market share in 2017. However, the AI-based voice recognition system is estimated to be the fastest growing market during the forecast period and is anticipated to grow at a rapid pace due to technological advancements. In addition, the technology-driven companies are using the AI-based voice recognition system as a tool for developing advanced infotainment features for autonomous and semi-autonomous vehicles. The luxury vehicle segment is estimated to hold the largest market share, by volume and value, for voice recognition system market during the forecast period. However, the economy vehicle segment is estimated to be the fastest growing market because of the rise in demand for comfort and convenience features and integration of technology to support centralized functions in the vehicles. By the level of autonomous driving, semi-autonomous vehicle segment is estimated to be the fastest growing segment of the voice recognition system market during the forecast period. The consistent advancement in the infotainment features and growing automation in driving functions are the major factors driving the growth of semi-autonomous vehicle segment. However, the conventional segment is estimated to be the largest segment of the voice recognition system market during the forecast period. The voice recognition system market for battery electric vehicles (BEV) is estimated to be the fastest growing market in the fuel type segment. This growth is due to the increased production of electric vehicles. The largest market in the segment is the internal combustion engine (ICE) vehicles, and it is expected to remain an attractive market in the near future due to its production and sales. The Asia Pacific region is projected to be largest market for voice recognition system for automotive in 2025. Rise in the production rate of automobiles and significant adoption of advances technologies in automotive electronics are the market drivers in this region. Being the largest market of passenger vehicles, North American voice recognition market is estimated to be the largest in 2017. The rapid growth of semi-autonomous and autonomous vehicles coupled with rise in consumer demand for convenience features in mid-variant cars are the factors putting North America region at leading position in 2017. The key factor restraining the growth of voice recognition system market is the high cost of high-end voice recognition system. However, the cost of the voice recognition system is likely to decrease in the coming years because of higher adoption rate by vehicle manufacturers to equip passenger cars with voice recognition system. Also, the number of suppliers for automakers has risen in the recent past. Cost is not the parameter considered in premium segment cars, but it may substantially affect the economy and mid-segment vehicles. The voice recognition system market is dominated by a few global players and comprises several regional players. Some of the key manufacturers operating in the market are Nuance (US), Microsoft (US), Alphabet (US), Apple (US), and Harman (US).